When a Boston jury handed down a death sentence last month to 21-year-old Dzhokhar Tsarnaev, a U.S. citizen of Chechen Muslim descent, it was the culmination of the sort of show trial in which the U.S. rulers revel. The Obama Justice Department seized on the case as soon as Tsarnaev was arrested for involvement in the 2013 Boston marathon bombing, a criminal act of indiscriminate terror that left three dead and over 260 wounded. Waving the Boston bombing as a bloody shirt, the federal government pulled out all the stops to pack Tsarnaev off to death row and put a shine back on capital punishment. The Feds were not about to be frustrated by the fact that Massachusetts abolished the death penalty decades ago. These overseers of the entire machinery of bourgeois state repression simply took the case to federal court, where they repeatedly brushed aside defense offers of a guilty plea in return for life without parole. At trial, prosecutors “death qualified” the jury by striking anyone opposed to capital punishment in a city where the overwhelming majority is opposed to putting Tsarnaev to death. As Marxists, we oppose the death penalty on principle, for the guilty as well as the innocent, and Tsarnaev is no exception. We do not accord the state the right to decide who lives and who dies. The great majority of those on death row are poor and disproportionately black and Latino, lacking decent legal representation and thus excluded from the justice that only money may buy. Public support for the death penalty has eroded over the last two decades in the wake of the exonerations of scores of innocent death-row inmates, along with a series of ghoulishly botched executions. Nineteen states, including most recently Nebraska, have banned capital punishment, and another eight states have moratoriums. The last federal execution took place in 2003, with Washington effectively putting a moratorium on executions five years ago. Nevertheless, both capitalist parties—Democratic as well as Republican—are determined to maintain this ultimate sanction in the arsenal of state repression. Even when, shortly after a horror-show execution in Oklahoma last year, Barack Obama directed then-Attorney General Eric Holder to review the implementation of the death penalty, the president reiterated his support for capital punishment. The White House especially wants to have the option to execute so-called terrorists and those convicted of “crimes against the state” such as treason or killing a federal officer. The current administration is seeking to remove the cobwebs from the federal apparatus of execution, which was given a major boost by the last Democratic regime. By signing both the 1994 Federal Death Penalty Act and the 1996 Antiterrorism and Effective Death Penalty Act, Bill Clinton vastly expanded the federal death penalty and gutted the habeas corpus right of state prisoners to have federal courts review their convictions. Soon after, the assembly line of death kicked into high gear, reaching 98 executions in 1999. In addition to shining a light on the bloodthirstiness of this country’s capitalist rulers, the Boston case starkly illustrates the all-sided shredding of civil liberties under the rubric of the “war on terror.” Right after the marathon bombing, the Boston metropolitan area was placed under a virtual state of martial law as National Guardsmen and SWAT teams backed by helicopters and armored vehicles sealed off streets and carried out house-to-house searches. The federal dragnet extended to three UMass-Dartmouth students who were sentenced earlier this month to three to six years in prison for removing Tsarnaev’s backpack and laptop from his dorm room after the bombing. With Republicans initially howling to dispatch Tsarnaev by branding him an “enemy combatant” and locking him away indefinitely, the Obama White House preferred to prove that the federal courts could just as effectively dispatch the accused, while adding a thin veneer of due process. How thin a veneer was evident from the moment of Tsarnaev’s arrest, when government officials boasted that they would not even make a pretense of honoring his basic Constitutional rights. Tsarnaev was interrogated for hours at his hospital bed without a Miranda warning and despite his repeated requests for a lawyer. With the Justice Department out to get rid of Miranda protections altogether for alleged terrorists, the creeping police state now has another precedent for gutting procedural rights for the accused more broadly. Once in custody, Tsarnaev was gagged with “special administrative measures” isolating him from other inmates and denying him access to the media. His visits, calls and mail were monitored and restricted to family members and legal counsel. Tsarnaev’s lawyers were also prevented from disclosing their communications with their client except for purposes of legal defense. The U.S. government also asserts its right, both at home and abroad, to simply blow away those whom it views as “terrorists,” as in the case of Ibragim Todashev, a 27-year-old acquaintance of Tsarnaev who was gunned down two years ago in his Florida apartment after a 4-hour interrogation by an FBI agent and two Massachusetts state troopers. After Todashev was killed, one of the troopers texted his fellow officers “well done” and “great work.” Predictably, it was first claimed that Todashev threatened the officers with a knife, but a week later the Feds admitted he was unarmed. When it comes to terror, blood-soaked U.S. imperialism has no equal. Its history of raining death and destruction across the globe is long and sordid—witness everything from the A-bombing of Hiroshima and Nagasaki and massive napalming in Vietnam to the Obama administration’s drone warfare in Central Asia and the Near East. Within the U.S., fighters for labor’s cause as well as black militants have been targeted for death by the capitalist state over the years—such as anarchist workers Sacco and Vanzetti, executed in Massachusetts in 1927, countless striking workers killed on picket lines by cops and National Guardsmen in the early decades of the 20th century, and the 38 Black Panthers assassinated by the FBI’s COINTELPRO conspiracy in the 1960s and ’70s. The ruling class is ever eager to bolster its repressive state apparatus, an instrument of organized violence against working people and the oppressed in defense of capitalist profit and rule. Labor has every interest in fighting the federal government’s drive to strip people of rights and sharpen the executioner’s ax. Ultimately, such measures are directed against the ability of working people and the oppressed to struggle in their own interests against their exploiters. On occasion, the American rulers engage in a charade over how to more “humanely” put people to death. In recent years, manufacturers in Europe and the U.S. have, for their own reasons, stopped providing the sedative used in the execution cocktail. States have scrambled to find substitutes, like the one that had Charles Warner writhing in agony while strapped to the gurney in Oklahoma earlier this year, crying out: “My body is on fire!” Now the Supreme Court is considering the case of three other condemned prisoners from that state attempting to block the use of the same drug. In the face of the drug shortage, politicians in some states are now debating gruesome alternatives to lethal injection: firing squads, electric chairs, the gas chamber. In the states of the former Confederacy, the death penalty is not about to go away. Indeed, while nearly every other advanced industrialized country has abolished capital punishment (with the notable exception of Japan), its persistence in the U.S. is rooted in the legacy of black chattel slavery. Slaves were killed with impunity for “crimes” ranging from insolence toward whites to rebellion against the slave masters. It took a bloody Civil War to smash slavery. But the promise of black freedom was betrayed when the Northern capitalists ended the period of Radical Reconstruction by withdrawing federal troops from the South, leaving black people impoverished and largely defenseless. With the Ku Klux Klan as the spearhead, the white propertied classes subjected blacks to legally enforced racial segregation, stripped them of all democratic rights and held them down through terror, especially lynching. The black population was consolidated anew as a specially oppressed race-color caste. Capital punishment in America is a direct descendent of and replacement for the lynch rope. In the 1890s, blacks were lynched at a rate of one every other day; four decades later, the state was carrying out executions at the rate of one every other day. A 2015 study by the Alabama-based Equal Justice Initiative titled “Lynching in America: Confronting the Legacy of Racial Terror” documents nearly 4,000 lynchings in the South, noting: “By 1915, court-ordered executions outpaced lynchings in the former slave states for the first time.” In the period between 1910 and 1950, black people made up 75 percent of those executed in the South. The racist application of the death penalty was sanctified by the U.S. Supreme Court in the 1987 case of Warren McCleskey, a black prisoner executed in Georgia in 1991. McCleskey’s attorneys presented an authoritative study detailing that black people in Georgia convicted of killing whites were sentenced to death 22 times more frequently than those convicted of killing blacks. In rejecting McCleskey’s appeal, the Supreme Court explicitly acknowledged that to accept this premise would throw “into serious question the principles that underlie our entire criminal justice system.” In its callous pronouncement, the court expressed a basic truth: McCleskey was a victim of the racism that pervades the criminal justice system. As guardians of the American bourgeois order, the capitalist state is also committed to enforcing the oppression of black people that is its bedrock. For black liberation through socialist revolution! Finish the Civil War! We welcome the recent repeal of the death penalty in Nebraska and any other measure that would curtail capital punishment. But even if the death penalty were eliminated, it would not fundamentally change the violently racist and oppressive nature of capitalist class rule. The slowdown on death row has not slowed the executioners in blue uniforms from gunning down black people and Latinos in the streets. Moreover, under capitalism all reforms are reversible. In 1972, at a time marked by the tumultuous social struggles of the civil rights and Vietnam antiwar movements, the Supreme Court declared the death penalty as practiced unconstitutional, ordering states to rewrite their laws. A mere four years later, the Court gave the green light for the killing machines to resume their grisly work. The next year, Gary Gilmore was executed by firing squad in Utah. The International Socialist Organization (ISO) has posted an April 29 article by the national director of their Campaign to End the Death Penalty that recycles the liberal prognosis that “the death penalty, it seems, is dying” and summons activists to “continue to chip away at the death penalty system” (socialistworker.org), without a word of criticism of the Democrats. Here is yet another expression of the reformist illusion that the cruelties and “excesses” of the capitalist state can be chipped away, leaving behind institutions that act humanely and justly from the standpoint of workers and black people. In contrast, we Marxists aim to imbue those protesting the depredations of U.S. capitalism with the understanding that putting a final halt to the rulers’ machinery of death—the killer cops, the swollen prisons, the imperialist military—requires sweeping away the whole capitalist system through proletarian socialist revolution. Death sentences, the “living death” of life without parole, and the whole concept of punishment under capitalism are relics of ancient religious codes of retributive justice. As we wrote when the Supreme Court reinstated the death penalty in 1976: “The Marxist attitude toward crime and punishment is that we are against it.... Socialists do not proceed from the standpoint of punishing the offender. Such a vindictive penal attitude is fundamentally a religious rather than a materialist conception of social relations” (WV No. 117, 9 July 1976). Of course, a humane and rational society, which capitalism decidedly is not, may find a need to separate out certain dangerous individuals—for the protection of others as well as the offenders themselves. But this would be done without stigma or deprivation and with education, medical care, rehabilitation and the goal of reintegration as productive members of society. At the same time, the Bolsheviks did not flinch from the necessary and extraordinary measures of Red Terror required by the 1918-20 Civil War against imperialist-backed counterrevolutionary forces. But the penal code was a more permanent feature of the proletarian state, embodying the Bolsheviks’ expectations that the securing of Soviet power and the extension of the revolution internationally would open the path to the gradual withering away of the state. It was only after the parasitic bureaucracy around J.V. Stalin usurped political power from the proletariat that the old “tortures and torments” denounced by the early Soviet government, including the death penalty, were resurrected as permanent features. Despite this bureaucratic degeneration, the Soviet Union remained a workers state based on collectivized property forms. The Trotskyists continued to defend the Soviet Union unconditionally against imperialist attack and internal counterrevolution, while calling for proletarian political revolution to oust the bureaucrats. Our perspective is that of Lenin and Trotsky—for socialist revolutions to overturn capitalism worldwide and the repressive state machinery that defends it. There can be no fair or “humane” system of justice for the working class and oppressed in a society based on exploitation. With its central position in production, the working class has both the social power and the material interest to shatter the capitalist order. To bring that consciousness to the proletariat requires forging a revolutionary workers party of the Bolshevik type. 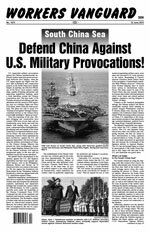 Defend China Against U.S. Military Provocations! U.S. Out of the Near East! Down With Saudi-led War in Yemen!